Fiction may be the “liar’s art,” but research is critical to making any liar’s story believable. Currently I’m writing a thriller set in 1925 Denver. I’ve consulted 15 or 16 books on the 20s in general and Denver in the 20s in particular to help me create a realistic atmosphere for my fantastic tale. My antagonist was a real person in 1880s France, a truly vile human being who committed unspeakable acts. Well, maybe not unspeakable since I speak of them in my book, but certainly despicable. Naturally, I embellished his history, or the end of it to be more accurate, giving his repugnant activities an ironic twist. It’s not just the big things that I like to research. For example, I have house plans for my protagonist’s home. I have a photograph of her car, her furniture, her neighborhood. I have a map from Denver in the 1920s and I spent time at Fairmont Cemetery photographing tombstones and crypts to assist me when I writing the (inevitable) cemetery scenes. I downloaded a history of a military unit from Colorado that fought in World War I and a coroner’s inquest from the 1920s in order to capture its essence. I’ve visited the Greek Theater at Civic Center in downtown Denver and I’ve driven the streets in Capitol Heights (now called Congress Park) just east of Capitol Hill. I met with the president of the Denver Police Museum who provided me the kind of information I might never find in a book or old newspaper. I know many people find this kind of research maddening, infuriating or just mind-numbingly dull. (“Oh, my God, are you insane? I’d rather get naked and fight badgers!”) Of course I have friends who are at their happiest when they’re greasy up to their elbows tearing into an engine block or dismantle a car they want to rebuild. The thought of doing those things sends shudders down my spine (“Grease under my fingernails? Are you kidding me? How ridiculous.”). 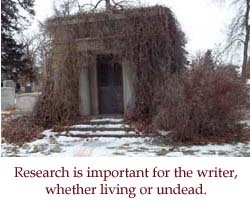 Research for writing is crucial. Whether looking for facts concerning a bygone era or seeking answers to a contemporary problem and situation, research is the backbone of a good story. Armed with research, fiction can be built on a foundation of factual information that not only brings authenticity to scenes and chapters, but creates a believable frame of reference.